Next week a high-ranking Microsoft executive will stand on stage and show off a new version of Windows on a tablet computer. 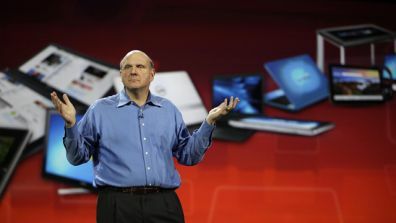 Chief executive Steve Ballmer did it last year. Co-founder Bill Gates did it 10 years ago. This time, when Windows chief Steven Sinofsky shows off an early version of its next touch-enabled, tablet-friendly operating system — code-named Windows 8 — to independent developers at their annual conference in Anaheim next Tuesday, there is a sense that it really matters. “It’s a big deal,” said Todd Lowenstein, portfolio manager at HighMark Capital Management, which holds Microsoft shares. Despite foretelling the tablet revolution a decade ago, Microsoft is last off the blocks with a salable device. The tablet PC Gates unveiled at the Comdex tech show in November 2001 was too clunky to catch on. The slick-looking Hewlett-Packard prototype slate brandished by Ballmer at the Consumer Electronics Show in 2010 did not even make it onto the shelves. The first generation of touch-enabled tablets running Windows 8 are expected on the market in about 12 months. That gives Apple two and a half years head start with its iPad, which has already sold 29 million units. Tablets running Google’s Android software will also have gained ground, likely boosted by an expected Amazon.com device. The shift away from desk-based PCs — which mostly run on Microsoft software — toward tablets and smartphones is happening quicker than expected. The future of Microsoft, and its moribund stock, may hinge on how well Sinofsky can sell the latest combination of tablets and Windows. First, Microsoft needs to get itself back in tune with developers and entrepreneurs who are flocking from Microsoft-centric programing platforms to the more exciting realms of Apple and Android. The shift to a Apple-based culture is noticeable among innovators and entrepreneurs, said Matt McIlwain, managing director at Seattle-based venture capital firm Madrona Venture Group. The enthusiasm of independent software developers is key for the health of what Microsoft calls its Windows “ecosystem”. It has stirred excitement with its new motion-controlled Kinect system for the Xbox game console, but is lagging in the exploding market for mobile apps. Apple iPhone and iPad users can download 425,000 apps, while Android users have a choice of 250,000. There are only 30,000 apps for Windows Phones, although that is expected to grow when Microsoft launches its own app store with Windows 8. Microsoft finds itself playing only a background role in many tech-savvy startups, such as fashion site StyleCaster, which uses Apple computers, Google email, Linux web systems and Amazon.com Inc for its data storage. “In the last four or five years, ever since the iPhone platform came out, you have even more developers who have moved over onto Apple systems, and that’s created more and more tools,” said Drew Butler, StyleCaster’s vice president of technology. Not everyone is so downbeat. Wes Greene, lead mobile developer at Seattle-based Groundspeak, which makes a leading app for geocaching — basically GPS-enabled treasure hunting — for Windows, Apple and Android phones, expects Microsoft’s deal with Nokia to bring it into the mobile mainstream. He likes what he has read so far about Windows 8.